1Clicksmt automatic soldering robot is equipped with 400W high frequency heating system with rapid heat recovery. Induction type soldering tip heating speed is very fast.Break-tin automatic solder wire feeder can reduce flux remaining problem after soldering.Both of them can make the stable soldering quality. Why is Stabilization of Solder Amount Required ? 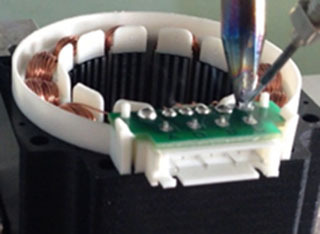 An important reason for quantitative stabilization of the solder amount is that if the solder amount varies in particular when automating, the temperature that melts the solder changes and continuous stability is lost. In terms of quality, it also causes bridges, solder sags to the backside of PCB, and a lack of solderability. How to Stabilize Solder Amount! The H351 break tin solder wire feeding system can pierce holes when feeding solder wire, it can reduce burst tin that causes flux remaining on PCB when soldering under high temperature to improve the soldering quality. 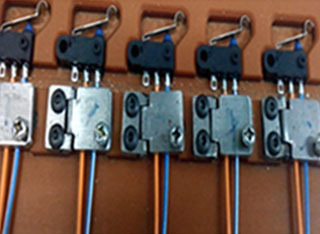 solder wire feeding accuracy can reach 0.1mm. Many advantages arise by stabilizing the solder amount, that is not only for making stable soldering. The H351 enables soldering without bridging even with fine pitch soldering. H351 heating element adopt silver coil which can ensure long lifetime. 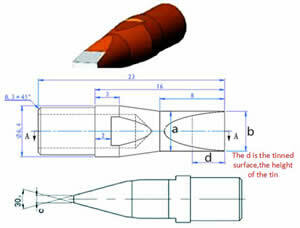 soldering tip can be easliy changed with lower cost. There is very little flux explosion and it results in little solder balls as well because heat expansion pressure of flux can escape from the solder cutting surface when the solder is melted. Why Can the H351 Stabilize the sullpy of heat ? 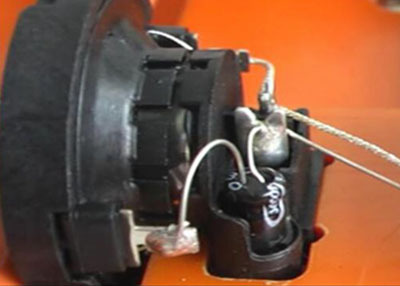 400W high frequency induction heating system has rapid temperature recovery time. 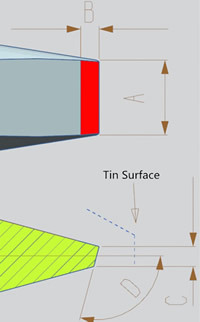 Three sections of sending tin and three sections of heating time are set in the software of the machine to ensure the stability of welding quality. Stable Heat Supply Technology ! 400W high-frequency soldering iron assembly, rapid temperature recovery, temperature compensation in a short time, to ensure that the heat of the pad evenly, to ensure the soldering quality of solder joints. H351 equip with 400W soldering station (optional 600W soldering station).It can make soldering the component which has big heat loss such as grand pattern and shield case in a relatively short time. Comparing to conventional automatic soldering robot, the power is around twice to them. H351 equip with 400W soldering station (optional 600W soldering station). It can make soldering the component which has big heat loss such as grand pattern and shield case in a relatively short time. 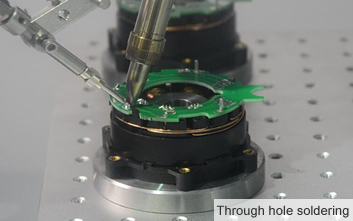 Comparing to conventional automatic soldering robot, the power is around twice to them. H351 equip with 400W soldering station (optional 600W soldering station). It can make soldering the component which has big heat loss such as grand pattern and shield case in a relatively short time. Comparing to conventional automatic soldering robot, the power is around twice to them. Stabilization of the H351'S Soldering Tip ! Various soldering tips can meet different process requirement. 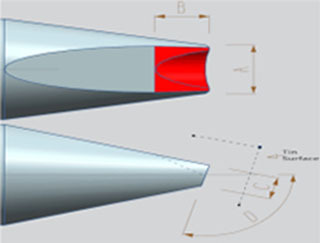 Customized solering tips is also available. Heating core and soldering tip are separate individuals. Heating element adopt silver coil which can ensure long lifetime. 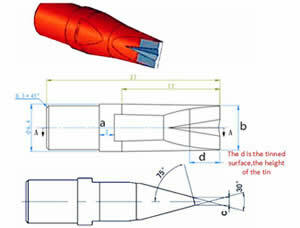 Induction type soldering tip can be easily changed with lower cost. 2、When soldering the pad, ensure that the head of the soldering tip cannot touch adjacent other pads. 4、The soldering tip type of RDD and RDK ,both of them can be used for point solder. (For the soldering tip type RDD can be used in point solder,it main used for the soldering pad with small pin.For the soldering tip type RDK can be used in point solder,it main used for the soldering pad with big pin). Normally we choose the height of the tinned surface is 1mm.If the pin of the pad is too big,we need choose the high tinned surface soldering tip. (Please look at the B in the picture,it is the height of the tinned surface on the soldering tip). 5、If the customer still don’t know how to choose the soldering tip,Please ask the customer send us the gerber file of the product.We need get the all pads diameter(size) and the spacing between adjacent pads for all pads on the PCB. 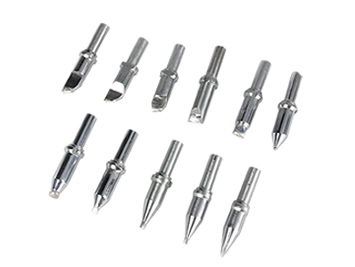 1、Variety soldering tip ,meet different soldering condition. 2、The soldering tip is made in Japan.The soldering tip structure and material is the same with Appolo seiko. Appolo seiko soldering tip can also be used directly on the soldering head. 3、Resistance heating system.Direct heating method,heating up very fast. 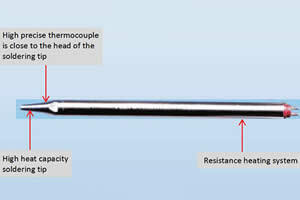 4、Accurate temperature measurement: The high precise thermocouple is close to the head of the soldering tip.It can keep display temperature the same as the actual temperature of solder tips. 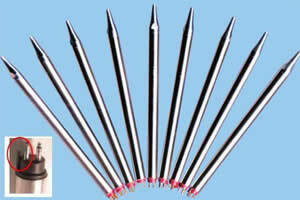 5、High heat capacity soldering tip:heating up fast,temperature stability. 6、The ability of getting tin is strong, do not oxidize.There will be no non-stick tin, no climbing tin phenomenon on the soldering tip. 7、Oxygen-free copper, high strength, good wear resistance, high temperature, lead-free alloy Iron plating dense, long service life. 1、The width of the soldering tip is 0.5-1mm larger than the diameter of the soldering pad. (In below picture ,the silver color is the soldering tip tinned surface.Please look at the b in below picture,it is the width of the soldering tip).